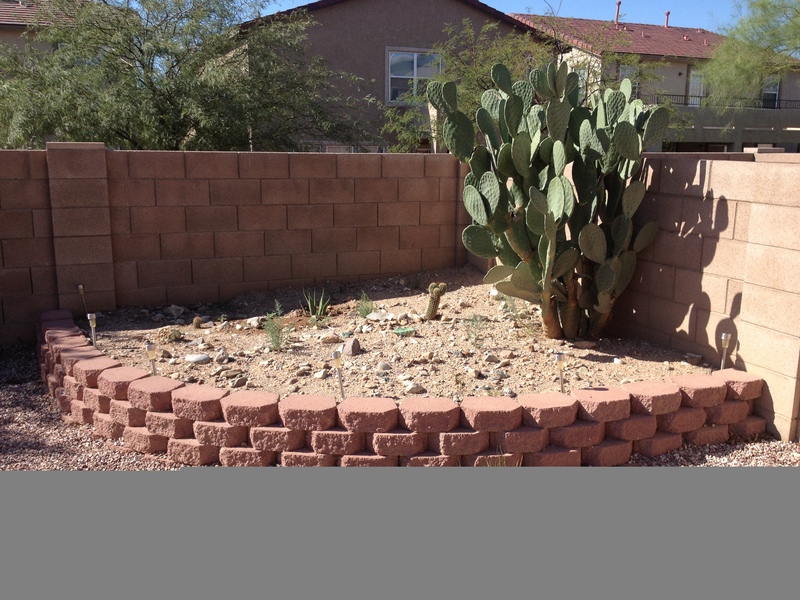 On the right-hand side of our back yard is the raised bed quarter circle cactus garden. It is a garden that has seen much death. Jeremy and I have replanted about ten different kinds of cactuses in it and the only one to survive long term is our prickly pear. The prickly pear is now far too large and I need to trim it. Again. Nothing will kill the prickly pear. Even the heavy frost we got two years ago which killed everything else in the cactus garden couldn’t kill it. It looked pathetic, with a dozen or so drooping, rotting pads but when I trimmed it up, it bounced right back. Is it out to get the other cactuses at night on top secret little spiny toes when no one else is looking? Is it just the strongest plant in the desert? How in the world can I be so bad at cultivating native plants that don’t need much water? Well, after musing on the last garden post I wrote, I realized something important: I don’t read or research a single thing when I plant it. I don’t even closely read the little tags that come with the plants! I plant, I water, and hope for the best. So what do I expect? If you don’t really know what you are doing with gardening, it won’t magically come to you. You have to read stuff and talk to people. Now, as a busy family, I guess we have been poor readers and researchers for a long time in general. But I used to be such a nerd about things like this. How did I become so ignorant? Well, the last time I read non-fiction regularly was when I had my engineering/writing/research job at ECRI. It was a part of my daily work regimen to read and research the articles and journals pertaining to my projects. It was nice to have that knowledge and I still think about the things I learned when I was there. But I guess I didn’t read non-fiction at home even then. I’d read enough of it at work. When I moved out here, my non-fiction reading fell off the map entirely. So my reading habit for so long has been to read before bed. It helps me sleep as long as it is the right material: something funny, light, with a happy ending. Nothing that actually makes me think too much past closing the cover. I’m not about to give up my light reading before bed for more thought provoking stuff. But you know, it just isn’t enough to cultivate me as a person. I’ve heard time and time again that one key to being a successful person is to be constantly reading. But I haven’t known how to fit more of it in. It seems to be impossible, especially with the kids so little. If I am with them, they have my attention and when they are napping I must tackle the mountain of dishes or the mountain of laundry or the mountain of music tasks that need attention. But is it really so impossible? If something is important enough, you make time. Something else will suffer…but you make time. So now! We drop everything and read, usually between 7 and 8PM. After musing about all of the reading I wasn’t doing , I realized that my son, who is in first grade, and just getting independent at reading, doesn’t actually SEE us read. I realized I needed to give myself and my family a reading intervention and just clear a space, an hour a day for us to read. We’ve been doing it for about two weeks or so. It is nice family time. And I am woefully behind on my email (this is what got sacrificed). But I am getting some really good reading done! Some parenting books, spiritual books…and soon – a book on gardening, I promise! My father in law gave us an agave to grow in the Cactus Garden of Death. And there is some sort of skinny spiny cactus I need to take care of I planted after the frost that is still alive after a year. So I owe it to them to cultivate them and help them grow too! I am hoping that post-reading cactus garden will become the Arizona Garden rather than the Cactus Garden of Death. I’ll check back on that in a year.